I had to insert myself literally as a character, and be creative as a translator. Our latest Asymptote Book Club selection, Brice Matthieussent’s Revenge of the Translator, depicts a terrifying scenario for many authors. According to its translator, the main character is “an author’s worst nightmare”: a translator with their own ulterior motives. Follow up this conversation’s insights into the art of translation with our #30issues30days program, celebrating 7 years of Asymptote. Mallory Truckenmiller (MT): One defining quality of Revenge of the Translator is its translation within a translation structure, with the translator actually entering the plot of the novel. As the English translator, your role adds yet another layer to the work. How did you approach this position? Did you find ways to insert yourself as a new voice or character within your translation? Emma Ramadan (ER): Because the French novel Vengeance du traducteur is framed as a French translation of a (non-existent) English original titled Translator’s Revenge, creating my own English translation got a bit complicated. I couldn’t use Translator’s Revenge as the title of my translation, and at the end, when the narrator mentions a supposed “American translator” of Vengeance du traducteur currently undertaking the translation of the book into English in their city, that translator had to be me, that city had to be Providence. It had to come full circle and the reader of the English translation had to understand that this was an explicit reference to the book they were currently holding in their hands, a reference to my work, otherwise, the whole conceit falls apart. Which, in turn, adds extra layers: how faithful is this translation I’ve been reading? How much has this book I’m currently holding in my hands about a rogue translator been messed with in turn by its own translator? I had to insert myself literally as a character, and be creative as a translator, to do justice to Matthieussent’s multi-layered work and keep it from veering into total insanity. These writers' views of the world, it's like they see something none of us do, but as soon as they tell us, we understand it. ­­­Emma Ramadan has earned acclaim for her translations from the French of such diverse works as Morrocan Fouad Laroui’s The Curious Case of Dassoukine’s Trousers, Oulipian Anne Garréta’s Sphinx, and more. Her second Anne Garréta translation, Not One Day, recently won the 2018 Albertine Prize. Her forthcoming novel, Virginie Despentes’s Pretty Things, is due for publication by the Feminist Press on August 15th. 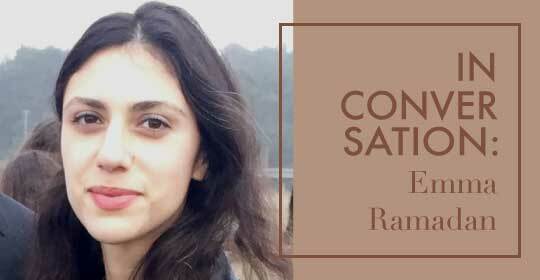 Together with her partner, Tom Roberge, Ramadan opened the bookshop-bar Riffraff in December, where she promotes her favorite texts and discovers what a sustainable life for a young female translator might look like. Here, Ramadan speaks with Asymptote’s Editor-at-Large for Portugal, Lindsay Semel, about French slang, gender in life and art, and what makes her love a text enough to translate it. Lindsay Semel (LS): I’d like to start by talking about Riffraff. What inspired you to open the place? Emma Ramadan (ER): Well, I always had this idea in my head that I wanted to do a bookstore-bar. There’s a couple of bookstore bars spread around the country and it just seemed like a really vibrant gathering spot and something that was working both financially and for customers. It felt like this distant, far-off project until I met my co-owner and partner Tom, who was also involved in the translation world. Providence came up almost immediately. There is a welcoming literary community because of the universities, but there is also a really great local business community. The west side of Providence, which is where we are, is basically all independent businesses. There aren’t any chains, there aren’t any giant stores, it’s kind of just this really lovely haven of local people fulfilling their passions and trying to make it work and it seemed like we would fit right in here. I grew aware of the immense distances spread out in front of me, breathing for me. “When I read Miquel de Palol,” says Mireira Vidal-Conte, “I see reflections of such authors as Claudio Magris, Robert Walser, Cortázar, Ray Bradbury, Clarice Lispector, Stendhal, Szymborska, Casares, Karel Čapek, Pessoa, Proust, Flaubert, or Novalis; but also of painters like Brueghel the Elder (the first of many predecessors of the surrealism of the detail) or the cinema of David Lynch, Fellini, or Wong Kar-wai. This is true irrespective of the genre, for the poet under discussion works not in a specific genre (save for that of language), but in the broader category of art. As a literary artist, he employs genre in the manner of a simple tool, employing the one that works or those occasions when it works. 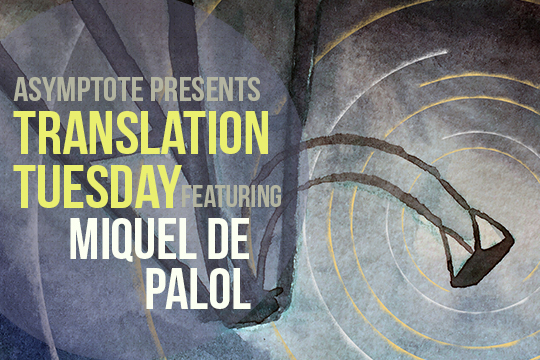 He is a poet when poetry is what is called for.” For this Translation Tuesday, we present an excerpt from The Garden of Seven Twilights, in which the great Miquel de Palol touches the real in all its vertiginous vastness in childhood moments spent face to face with the cosmos. This piece was first published last Thursday along with new work from thirty-one countries in our Fall 2017 issue. My American childhood, super-protected, closed in on itself, took place between Long Island and New England: Providence, Boston, Salem . . . Now they seem to me like places from a dream. My godfather Kaspar had a house on the outskirts of Boston, and I stayed there for long stretches in the summer, until my mother died. There was a swing between two apple trees in the garden behind the house, but from a very young age, I preferred to kill time staring at the cockroaches and butterflies.